A whole new set of quizzes on current world leaders and historical leaders! To get the most out of the historical leaders quizzes, be sure to try the different types of quizzes within each quiz... it's not just about knowing their names. There's trivia, facts, accomplishments and dates of power. 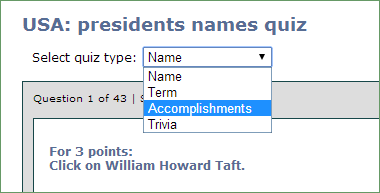 Look for Select quiz type below the quiz title and select the type of quiz you'd like to do. 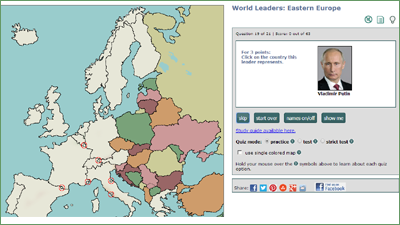 To get the most out of the world leaders quizzes, after you've mastered the basic matching of country names to leader names and photos, be sure to try the hybrid map quizzes, as they become available. You'll be shown a photo of a leader and you must click on the correct location on the map to answer the question. Sound on or sound off? All the leaders quizzes give you the option of audible feedback. So that classrooms and offices aren't inundated with unwanted dings and dongs, the quiz will always begin with sound off. Click the speaker icon just above the quiz question area at any time to toggle between sound on and sound off. When you switch quizzes, the sound will always be off initially. To hear now what these sounds are, click to listen to correct answer sound or the incorrect answer sound.